Well, this is quite something!! 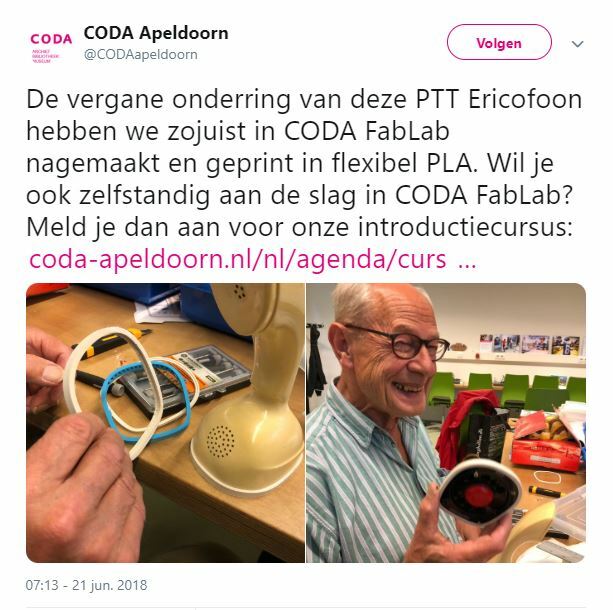 On Twitter I found this interesting experiment that someone has done in the Coda Apeldoorn. In the cultural center in Apeldoorn, Netherlands, there is this so called FabLab, where you can experiment with technology. Obviously last summer someone created a new rubber gasket for an Ericofon with a 3D printer. Cool!! The gasket was printed in 3D with the use of PLA (PolyLactic Acid). This is not actually a plastic as you would suspect but a substance made of wheat, corn and sugarbeets. It is much more sustainable than ABS (Acrylonitrile Butadiene Styrene) which is actually made out of oil. A very nice experiment! This entry was posted in history, technical on November 22, 2018 by admin.